There are no nests in our yard but we definitely have some kind of bee or wasp problem because my kids keep getting stung. I do see some flying around but they don’t go anywhere to a nest. And I can’t tell if they’re bees or wasps. Some are round and small but others are long and red. They just fly slow and sometimes they land and hang out for awhile. I don’t know if they’re eating my grass or laying eggs or something but when my kids go to the pool or try to run around, they keep getting stung. What can I use to keep them away that won’t hurt my kids? There are many insects that might be focused on your grass for either water, sap or some kind of food source. And when enough start hanging around, its just a matter of tome before someone gets stung. To minimize this risk and keep them away from your turf, we have two options. 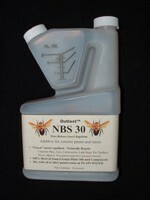 The first is to spray NBS REPELLENT over the grass. Use a good HOSE END SPRAYER to make the application or any standard PUMP SPRAYER for small areas. NBS uses all natural plant oils for actives. 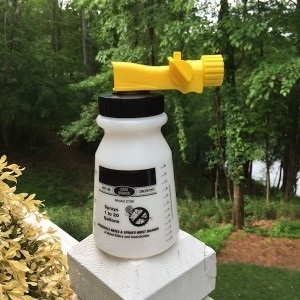 It won’t kill anything but flying pests like bees and wasps will stay clear of where its been applied. Mix 3 oz per gallon of water and plan on using 1 gallon per 1,000 sq/ft. Expect to get 30 days of repellency once applied but exact amount of protection you get will vary depending on local weather conditions. Remember, NBS will not kill anything. But it will effectively “reroute” insects elsewhere so they will learn to forage away from the treated zone. To make the application with our HOSE END SPRAYER, add the entire 16 oz to our Hose End Sprayer and then fill it with water half way to the 10 gallon line. Spray the entire tank over 5,000 sq/ft. The second option will kill insects which try to nest or hang out in your grass. 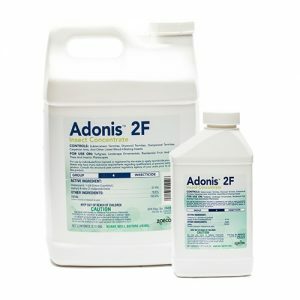 Generally used for grubs and other turf infesting insects, ADONIS is a non-repellent, long lasting active that will control most any pest that comes in contact with the treated area. Add 2.5 oz of Adonis to our hose end sprayer above and then fill with water to the 5 gallon line. Distribute the entire amount over 5,000 sq/ft 1-2 during the warm season. Treatments will generally last several months so you will definitely get longer lasting residual compared to NBS. Keep in mind this will not work fast compared to NBS but this is very much by design. After 2-3 days of touching treated areas, any insect landing will have picked up enough active to ensure its’ demise. By 1 week, you will see a marked improvement. During this time, any nesting insect will have “shared” their exposure with other members of their colony so they will know something needs to be avoided in your yard. This will cause them to forage elsewhere and keep your yard safe from these stinging pests.